A leading global manufacturer of innovative audio technology has opened a new UK HQ in Edinburgh. 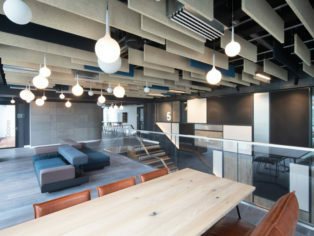 The company is recognised for its award-winning corporate culture and its new office interior reflects this ethos with facilities designed to generate a collaborative and vibrant workplace. 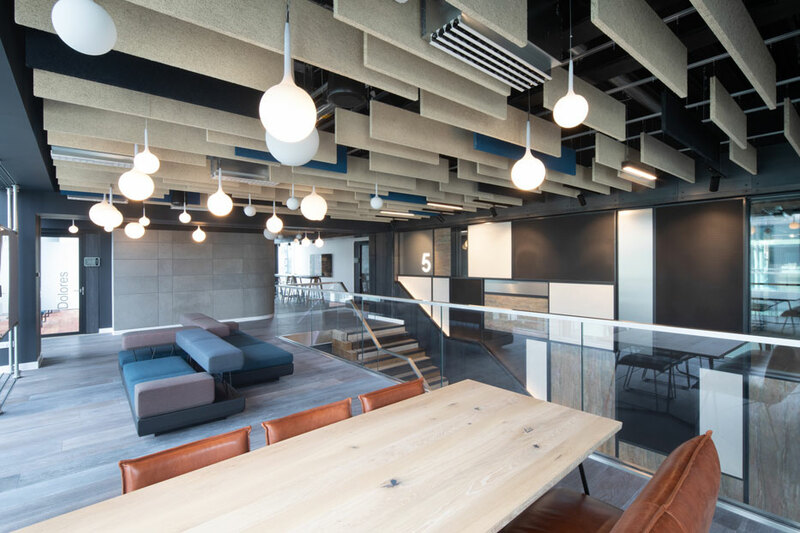 Heradesign ceiling rafts and baffles from Knauf AMF make a positive contribution to this vision by creating a healthy acoustic environment. Michael Laird Architects designed the four-storey office which has a variety of highly functional, flexible, inspirational spaces and workplace settings to support creative thinking. Heradesign with its organic wood-wool woven surface fits seamlessly into this contemporary interior, helping to create a motivational place to work. 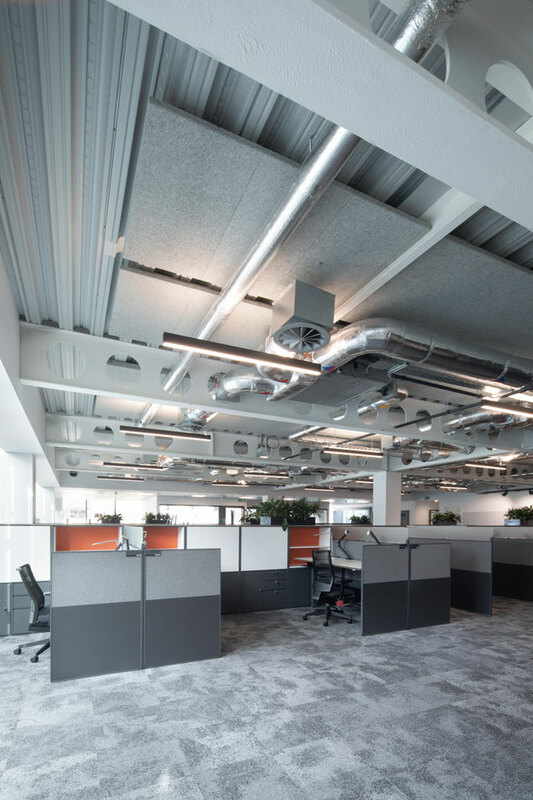 In the large open-plan office spaces, Heradesign ceiling rafts are fixed directly to the soffit, sitting above the exposed services. The light grey colour of Heradesign matches the chrome of the ducts and pipes, creating an eye-catching ceiling design. Open plan areas can generate intrusive noise. Research shows poor acoustics can harm productivity and staff morale. The Class A sound absorption of Heradesign helps improve staff wellbeing by effectively reducing all unwanted background noise ensuring staff can concentrate, and that meetings in the pods surrounding the open office spaces remain private. Heradesign ceiling baffles, fitted in three colours and sizes, create a striking design feature in the stairwells, circulation areas, games room and break-out spaces. Sound control is key to making these places work. Optimum acoustic performance is achieved by varying the distances between the rows of baffles. The baffles ensure any noise from people travelling up and down the stairs or along the corridors does not disturb those using the adjoining open areas for meetings. Andy McDougall at AG McDougall Ceilings installed the baffles and ceiling rafts, finding them quick and straight forward to fit. Heradesign is a versatile product, its surface can be matched to any colour, enabling it to enhance any design aesthetic. It is available in a wide selection of shapes, face patterns, edge details and sizes, and can be fixed to walls or suspended as ceilings, baffles and rafts. Manufactured from robust sustainable materials, Heradesign offers high impact resistance and superior fire resistance, which is paramount for any building.